RIO DE JANEIRO, Brazil (CNN) -- Thousands of people celebrated Friday on crowded Copacabana beach as the announcement that Brazil had been chosen as the 2016 Olympics host played live over huge screens erected above the sand. Thousands packed Copacabana beach in Rio de Janeiro after the city learned it will host the Olympics. "It was a fantastic victory. We beat the big cities. Passion talked louder," said one man as he danced to live samba music in front of the stage. Rio de Janeiro beat out Chicago, Tokyo and Madrid to become the first South American city to host the Games, something President Luis Inacio Lula da Silva made clear during his pitch to the International Olympic Committee. "It is a time to address this imbalance," he told committee members making the selection in Copenhagen, Denmark. "It is time to light the Olympic cauldron in a tropical country." Happiness was a big part of Rio's pitch after it was voted the happiest city in the world by Forbes magazine. "I thought that more than to the people, we owe this victory to our President Lula," said a woman wearing little more than a bikini. Rio also won points with an ambitious budget and new venues like the Joao Havelange Stadium, which opened for the 2007 Pan American Games. Rio's jaw-dropping natural beauty helped the city pull ahead of the competition. "Rio is full of all things quintessentially Brazilian: sun, sand, soccer, samba, sensuality," the editorial director of Fodor's Travel, Laura Kidder, wrote in an e-mail. "In Rio, it's about taking each day as it comes and living life to the fullest." Erik Torkells, editor for TripAdvisor, the world's largest online travel community, also praised the city for its social scene before the selection was made. "If the Olympic Committee wanted to be sure everyone had a good time, they'd go to Rio," Torkells said. The selection also had its critics in Brazil. "I don't think it's appropriate considering what our country is going through," said Orlando Pinto, a social worker. "We don't have good health services, education; we have transportation problems, housing problems, crime problems." Security and traffic remain enormous challenges to overcome in Rio de Janeiro. 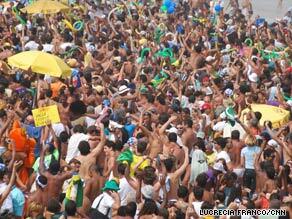 But it was all celebration on Friday as crowds continued to stream onto the beach after the announcement was made.